This original vintage poster, designed by Andy Warhol, was printed in 1997. It is conservation mounted, on linen, and in A condition. It measures 67 x 46 inches. Warhol began his career working in advertising. Long after he left the industry, he retained a connection to advertising, which is clear from his embrace of such items as the Campbell Soup can and the Brillo box, both of which he turned into iconic Pop Art symbols. In 1985, shortly before his death, Warhol designed a series of images featuring the iconic bottle of Chanel No. 5 seen through the lens of his signature silkscreen colorblocking. 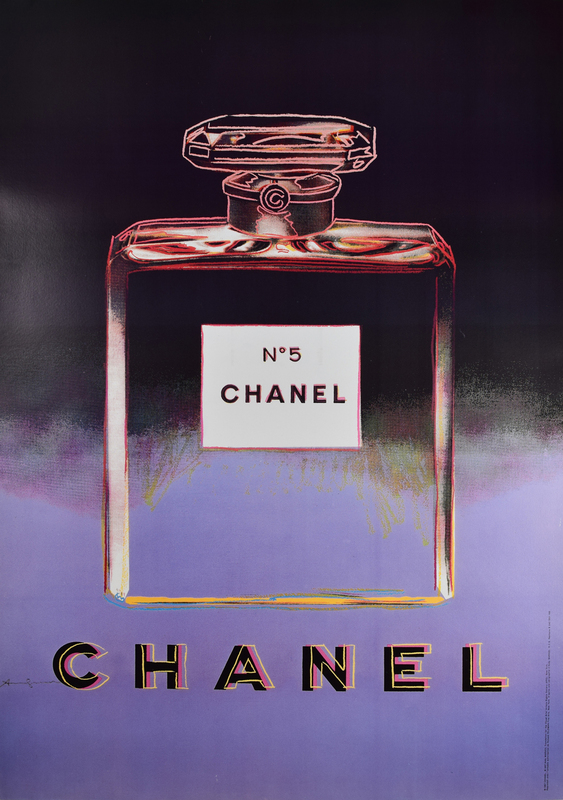 Years later, Chanel would reappropriate the designs for its own advertisements, putting out a series of four posters on a two color background., This is the Purple/black variant. The resulting posters exist in two sizes. This is the larger format, intended for use in the French bus stations and kiosks.The smaller format measures 28 X 20 inches. We have been collecting and selling original vintage posters for 30 years and we guarantee the authenticity of all of our posters. Find us at www.prints-posters.comz.